About Yes, you get fantastic donuts there. Very interesting to read the comments regarding where this picture is. Its in the Westchester/Inglewood area of Los Angeles. Many movies have been shot of this donut establishment. Its a well known LA landmark...not 100% sure it it is still there though. Great subject for a photo! Oh yes! This really gets me going! Brutal image! 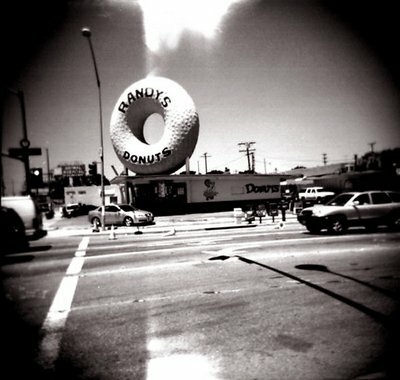 The rawness of the Holga combined with a monstrous american donut in a surreal landscape full of intense contrast. Brilliant! This looks familiar. Long Beach, maybe. It's like a world where there are only cars, and it looks comically hectic. This is so appropriate, because these American landmarks are disappearing quickly. Hey Cesira! The Holga is a $20, so called toy camera, Medium format, made of 99% of finest chinese plastic. The lens (I'm not even sure it deserves the right to claim that name) is a piece of plastic, guarantees distortion, vignetting, light fall-off; just to name a few of the imperfections. The body leaks light like crazy has one shutter speed of 1/100 or something like that, you have two apertures (well, you have two settings, but you may have to modify the camera, to have the second aperture as well). Sounds scary, right? But it can please you with wonderful and unique images. Check out the web and search for Holga & toy camera and you will find tons of information. what do you mean "lens piece of plastic?" Forgive me, but I'm still a beginner, don't know what Olga is! Very cool shot by the way... makes me think of pulp fiction, I don't know why! hahhaa yeah! did you visit? are you here? great holga! i love the light leak! Very Cool! Original and excellent photo. cool holga and nice subject. hmmmm donuts. Hi Carlheinz ! love your Holga images..one of my favorite cameras ! you know how to work it with expertise ! great shot ! The top and bottom light burns just drive me crazy! I love it. Hey Rik! Seattle? Never been there! Let me see! Yes, I told you that I need to buy you a drink one day! PS: your email is arrived. I will respond the next days. This reminds me of a early 60s slow-mo sequence, I just see everything here in a dreamy motion, utter ordinariness but something dramatic is about to happen (like the Kennedy shooting). Whew! great toy cam shot, bro. love the colors and the theme. you removed some reference in dimension by shooting the picture this way - for me, this looks like a toy story with toy cars and buildings and a gigantic donut. well done! Wonderful image again my friend.. I love the light leak..very well placed. Of course, the vignetting goes well with the shape of the donut.. Awesome! Big Holga Donut! :) love it! Dude-- your photos are getting more and more ominous as you go. You could probably take a lovely meadow and use that camera to make it look like Satan's playpen. Another unique and memorable image! It's certainly getting easier and easier for me to recognize your images here at Usefilm's thumbnails. I appreciate very much your style and vision. And this, clearly, is one of the reasons why. Looks like a Police Trap.